Construction crews will close the parking and travel lanes on SW 9th Avenue for three days to receive construction material. The sidewalk on the east side of the street will remain open to pedestrians. The closure is needed to receive and unload steel for one of the new stair and elevator towers. 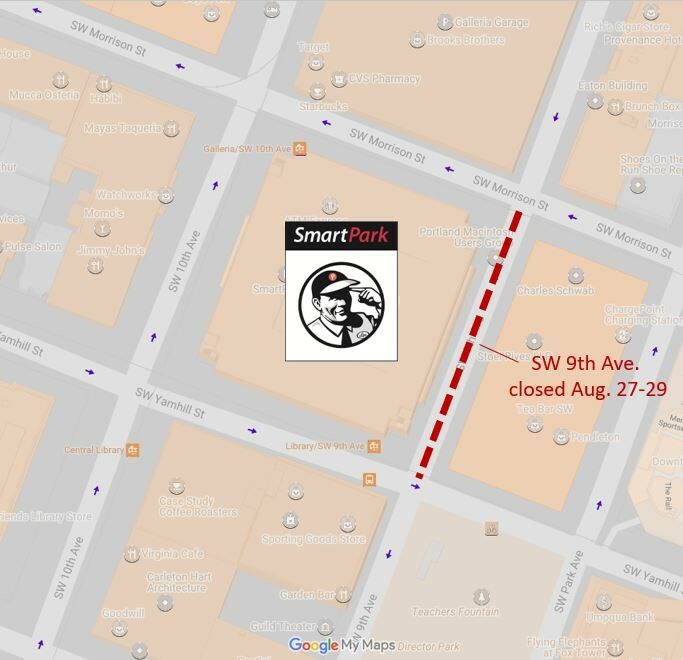 The street closure will take place starting the morning of Monday, Aug. 27 and continue through Wednesday, Aug. 29 for the block between SW Yamhill and Morison streets. The structural steel will be used for the stair and elevator tower at the corner of SW Yamhill Street and 10th Avenue. A crane will raise the steel to the top level parking deck where crews will transport it to the west side of the building. Periodic short term closures of 9th Avenue with flaggers have occured throughout construction. 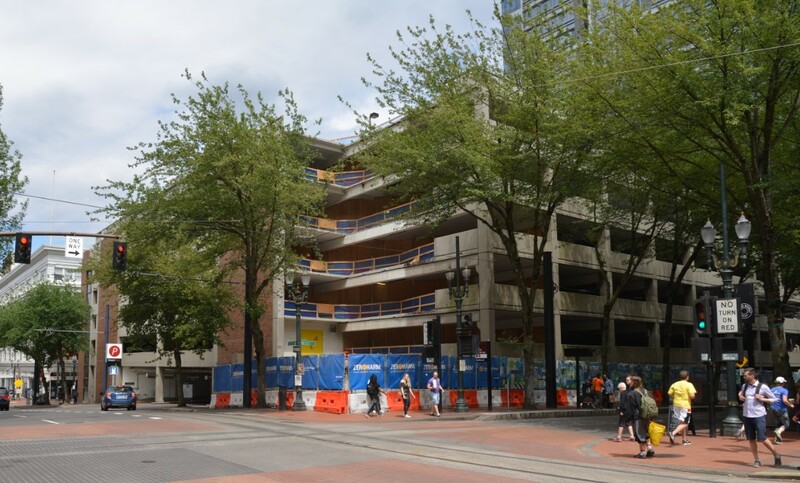 Traffic closures are limited to SW 9th Avenue to avoid disrupting MAX and Portland Street Car services, which run on three sides of the building. Thanks for your patience during this temporary closure. The stair and elevator tower at the southwest corner of the 10th and Yamhill garage, shown here, will be constructed first, followed by the northeast tower at the corner of SW 9th Avenue and Morrison Street. Crews are pouring foundations for the towers at the southwest and northeast corners of the building. Flaggers are directing traffic on SW 9th Avenue for concrete pours and other material deliveries. Steel for the northeast tower is being fabricated offsite now. We'll provide an update in coming weeks when SW 9th Avenue will again be closed to receive additional steel. Crews continue to power wash, coat, and stripe the parking surfaces throughout the garage. Current parking closures are noted at the garage entrance. Neighbors and garage users may periodically hear noise from pressure washing and an odor from the traffic coating when it is applied. The level two ZipCar parking spaces and bike lockers are temporarily moved to level four for resurfacing work. A sign at the garage entrance lets garage users know the current status of the partial parking closures.